"by the end of Nov. 2007, the number of blog spaces has reached 72.82 million in China, and with 47 million blog writers, it is reaching one fourth of the total netizens. This indicates the rapid growth of the blog market in China. " "some of China's educated elite may be growing impatient with a one-party authoritarian system in which anonymous bureaucrats decide what movies, plays, novels or social commentaries are safe enough for public consumption." "Perhaps Wikia will die before it even lives?" Ouch. "A California free speech group whose board of directors includes Google and Yahoo said on Monday it had asked U.S. trade officials to challenge China's Internet restrictions as a violation of global trade rules." "World opinion is divided on the importance of having a free press, according to a poll conducted for the BBC World Service." David Bandurski on the Beijing Association for Online Media: "today it is clear that BAOM has become an active agent of the Chinese government’s initiatives to stifle discussion of political issues." "you miss opportunities to get valuable insights into IT topics if you rely only on search engines alone"
"It's not entirely clear that the House Democratic leadership really meant this legislation to slap new restrictions on hundreds of thousands of Americans and small businesses who offer public wireless connections...."
Google Chart API looks like a great new thing for web journalists! Zhou Shuguang, aka "Zola," reports that he is home safe in Changsha after being detained in Shenyang, interrogated, made to write detailed reports on everybody he met and everything since arriving in Shenyang to blog about the Yilishen "ant-farmer" protests, had his ID and money confiscated (correction: the ID was retunred), punched around the head and neck a little when he objected to being forced to return by air (and pay for his own ticket) rather than travel by train, and then escorted by two state security police on the plane back to Changsha. He has been told not to go far, that they hope he will focus on his vegetable-selling business, and to report to the local police if he needs to go anywhere. Also known as the "nailhouse blogger," Zhou has been celebrated in the media and around the blogosphere since he led the effort by bloggers to cover the story of a couple resisting eviction by real-estate developers in Chongqing despite government efforts to stop media coverage of the issue. Since then he has come under fire for accepting money to blog about other people's eviction problems, among other things. He has also blogged from the anti-chemical plant demonstrations in Xiamen last March and even from the July 1st pro-democracy rally in Hong Kong. At the Chinese Blogger Conference last month in Beijing, he declared his intention to stop blogging and return to his home in Changsha, and to his old job as a vegetable-seller. But its hard to stop once you get the blogging bug. As the Shenyang ant-farmer protests began to heat up in late November, and as a media blackout quickly followed, his fans urged him to go investigate what was going on up there. So he bought himself a hard seat train ticket to Shenyang and arranged to meet up with a local blogger on the other end. 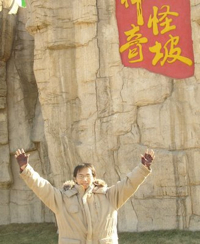 Zhou arrived in Shenyang last Friday November 30th, and managed to publish two blog posts (here and here) before he was detained on December 3rd. Upon returning home he sent a message out on Twitter that he was ok, but that Twitter account appears to have been taken down. Zhou wrote an extremely detailed blog post about his entire trip and detention/interrogation experience. I hope somebody will translate it in full. In addition to going through his computer, cellphone, and other equipment and getting a full record of everybody he had been communicating with, security agents wanted to know his motivations for going to Shenyang to blog about a sensitive issue. Zhou said he had two motives: curiosity about a sensitive topic in the news, and desire to sell advertising. The cops also wanted an explanation about a blog post Zhou wrote at the beginning of the year titled "Against the communist party, against one-party dictatorship." 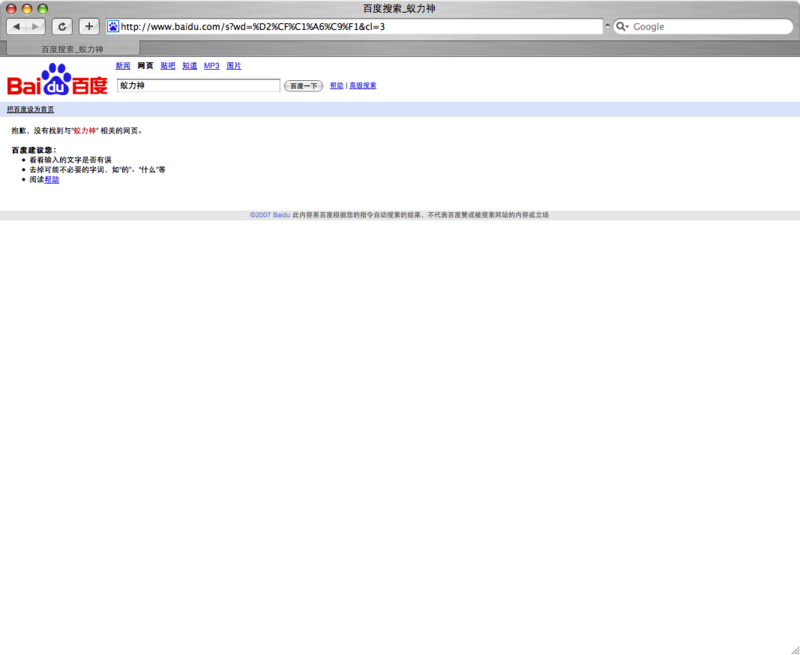 (Zhou's blog is hosted outside of China, because his original blog hosted inside of China was subject to censorship.) The security agents in Shenyang kept him up all night - with a few short nap breaks - questioning him and making him write his reports and confessions. He describes in great detail what they gave him to eat and when. Reading Zhou's detailed account, it's interesting to note what was negotiable and what wasn't as far as the security agents were concerned. They asked him to take down the two blog posts he had published while in Shenyang. He refused - insisting that they had to show him written proof of what laws the posts had violated. They were unable to give him such a document and eventually gave up insisting. As of this writing, those two blog posts still stand. Things got rough at the very end, however, when they said they were going to make him use all his remaining money to pay for his airplane ticket home to Changsha. He protested vigorously, insisting that he could only afford the train. At that point, he describes being punched in the neck a couple of times, and says he removed his glasses for fear they would be broken. He writes that at that point he remembered the case of Sun Zhigang - a young man who was arrested in Guangzhou for not carrying required ID, taken by police to a "custody and repatriation" center where migrants are detained, and ended up dead three days later - and decided not to argue any more. Zhou's experience is likely to put a damper on the impulses of other Chinese bloggers who may feel inspired to engage in "citizen reporting" on sensitive subjects that the media has been told not to cover. It comes, of course, in the midst of a crackdown on independent publications. Censorship of Chinese blog-hosting services continues to tighten. 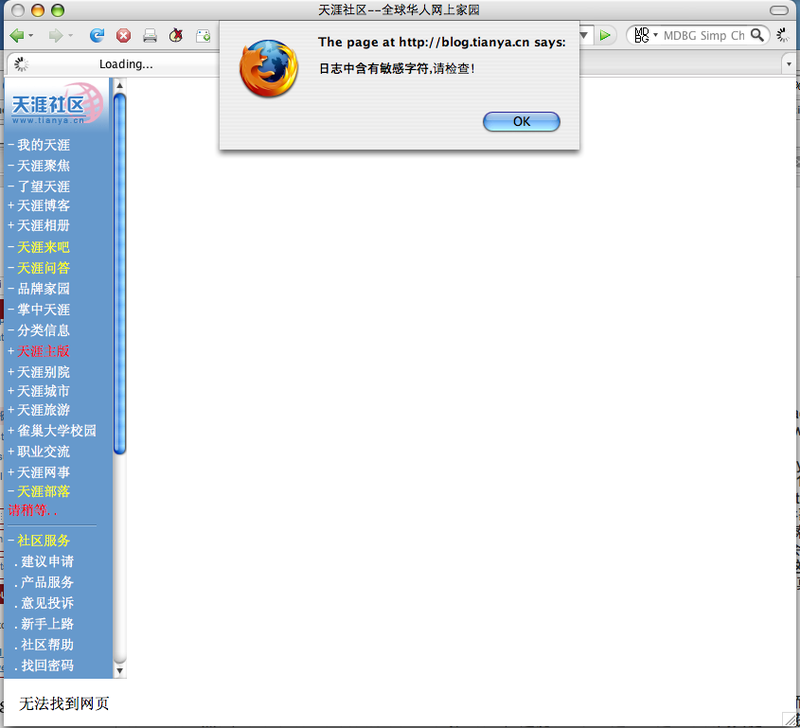 Late last week the Chinese-language meta-blog Memedia got blocked. Authors think it's because of this post which includes a paragraph about the Yilishen ant farm protests. So last weekend I copied that paragraph and re-posted it on a bunch of different Chinese blog-hosting services. All the services run by domestic Chinese Web2.0 companies censored it in one way or another. Below are two examples. One of the other services I tested was Sohu. (Click image at left to enlarge.) I was initially able to post the paragraph, but after about an hour, it disappeared from public view. Then when I went into the admin area to check whether it was still there, I found the post had been locked with an error message that begins: "Dear Sohu blogger-friend: Hello! We are very sorry to notify you that for certain reasons this blog post of yours is not suitable for open publication and has been locked." Then an explanation that you can still see your original text and pictures by logging in at the back end, and if you have further questions you can contact customer service at the following humber or email, etc. Only one blog hosting service run by a Chinese company did not censor the post - either immediately or within a few hours. (I am not going to say who they are lest I bring trouble upon them, but they know who they are and they deserve a pat on the back.) 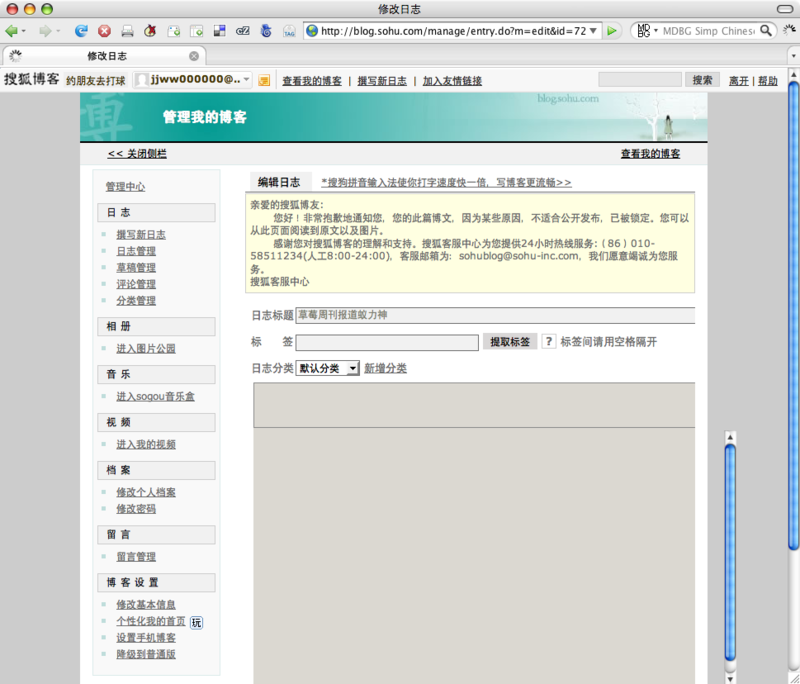 None of the foreign-branded blog-hosting services targeted at Chinese users that I tested censored it however. That includes Windows Live, Yahoo China, Tom and MySpace China. It's important to note that Tianya, which censored in the fashion shown above, receives major investment from Google. I will need to do a lot more testing on a wide range of content before making sweeping conclusions about which blog-hosting services enable their Chinese users to speak most freely, and which services are most restrictive. But my initial impression from this test and from other experiments is that in general (with the exception possibly of one Chinese company) the foreign-branded services enable greater lattitude than their Chinese competitors. Will this result in more users migrating to the foreign-branded services? Enough to put pressure on Chinese domestic services to censor less? Hard to know yet. It may also be that politically-minded bloggers are not numerous enough to be commercially significant. 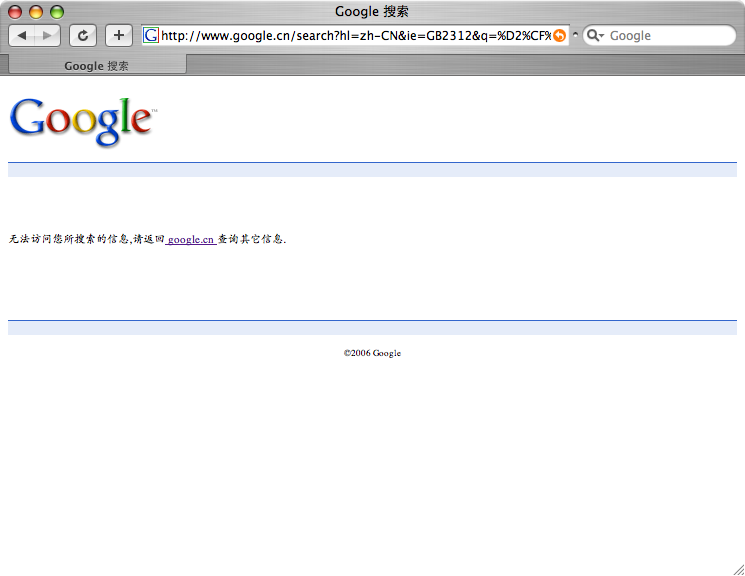 ...and on Google.cn (click image at left to enlarge). 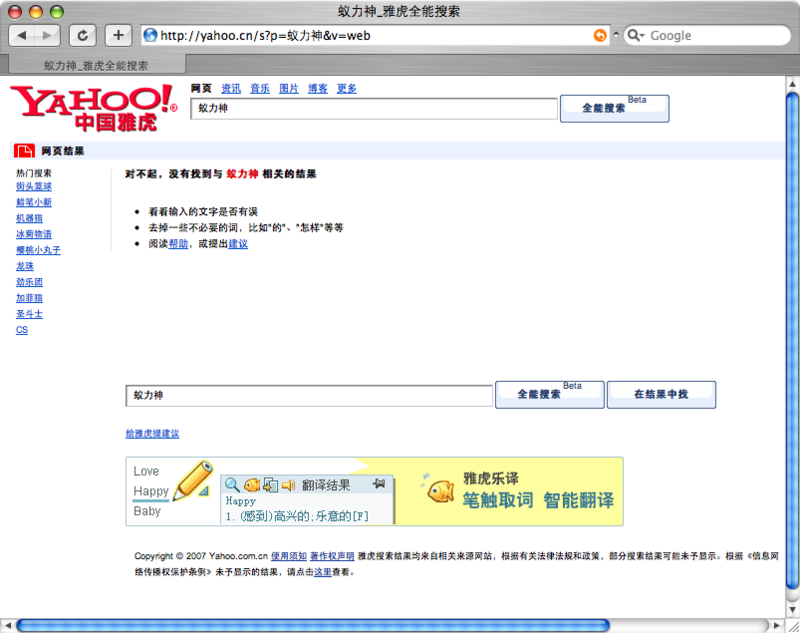 ...and finally, on Chinese Yahoo! (click to enlarge). "accusations leveled against the editors by state police cross the border into the bizarre, suggesting Chinese leaders are growing increasingly paranoid about social and political unrest and the role information might have in organizing resistance." Cai's speech "invoked Hu’s policy of media strengthening, or zuoqiang zuoda (做强做大), which calls for the creation of integrated media groups that are at once commercially powerful and mindful of party propaganda discipline." 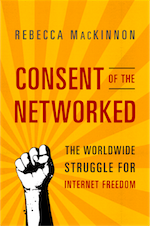 "Block access to the Web2.0 tools hosted outside of China and you frustrate activists, who would like to use those tools, but you don’t antagonize the average user, who is probably better served by tools written in Chinese for a Chinese audience." "The result of the weekend election is a fillip to the democratic cause after democratic parties suffered one of their worst defeats at the hands of pro-Beijing parties in local council elections two weeks ago." "Inside China...some of the smartest thinkers about the Internet believe the biggest hurdle to free speech in China isn't technical, it's social."